It’s often easy for one to think of fencing as a sport that places a great premium on individual skill, and to do so wouldn’t be far from the truth — the sport demands nothing but the quickest of wits and most attuned of instincts. 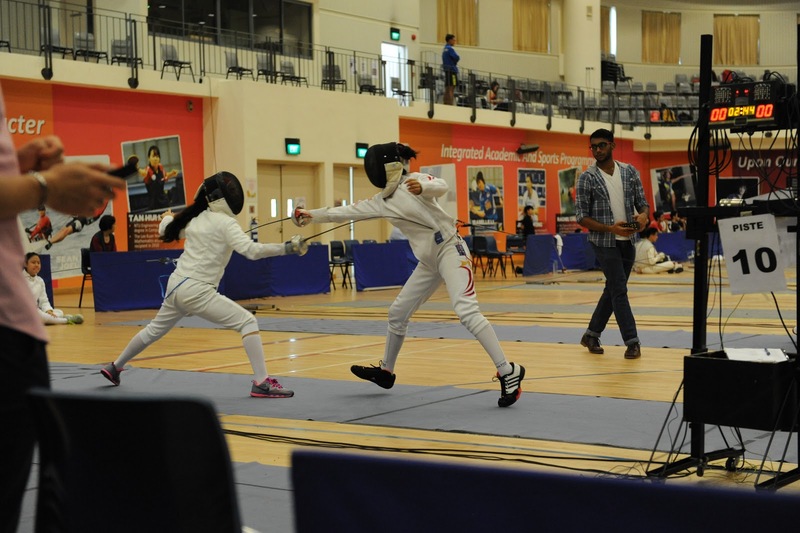 But Raffles Institution’s showing at the recently concluded National Inter-Schools Fencing Championships offered a refreshing perspective on this discipline, with our A Division fencers individually proving to us just what it really meant to be part of a team. Each one stepped forth with the backing of their teammates, proudly bearing the Gryphon on their sleeves. In fencing, athletes vie for points by striking at predetermined scoring zones on their opponents within a fixed period of time. Teams compete in three different events, distinguished by the weapon used: the foil, épée, and sabre. The tournament began with a series of preliminary rounds, requiring fencers to score 5 points to win that particular bout. Based on their total individual scores, 32 proceed to compete in the elimination rounds, where scoring 15 points clinches a spot in the next stage. Nimble footwork, precise blade-handling, and lightning-fast reflexes are important elements of the sport, where mere fractions of a second could mean the difference between triumph and defeat. Watching the action was certainly nerve-wracking. The Men’s Foil event was particularly intense with foilists going against several formidable national fencers, including top fencers in Asia. Preliminary bouts were especially hard to pass due to daunting opponents — however, 4 out of RI’s 5 foilists managed to qualify. 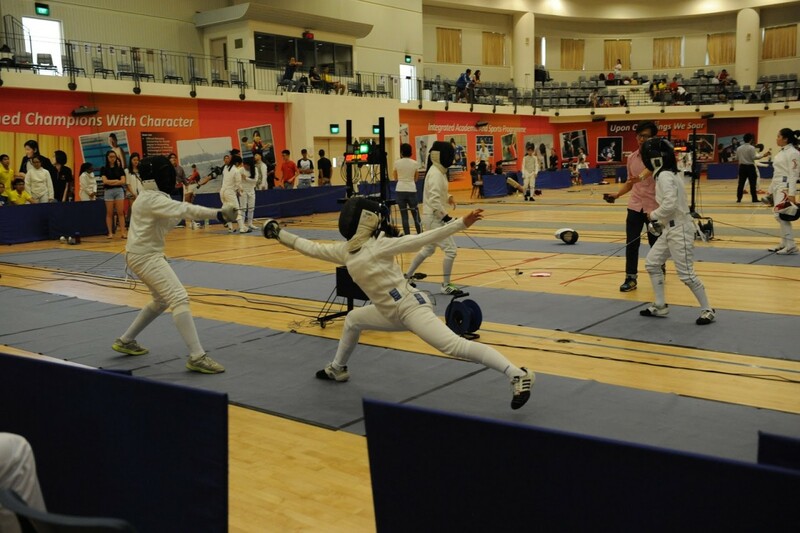 Foilist Ian Chung lost to finalist Jet Shang in a cruel match ending with a score of 15-1. Despite the intimidating point gap, Ian’s grit and tenacity remained unwavering till the very end of the match, which was very admirable indeed. RI’s Ariel Lim (15A01E) successfully qualified past the Men’s Foil preliminary bouts after gaining an impressive 21 points. His entry into the quarterfinals was greeted by the cheers of his fellow fencers, where he went up against Kevin Chan from HCI. Ariel’s perseverance especially shone during the semifinals as he stood strong and narrowed the disadvantageous point gap from a stressful 11-4 to a stunning 14-11. It was an intense match indeed and both competitors were on edge with the constant turning of tables. However, his hotly-contested matchup was lost to eventual event champion (and Asia’s top 16) Kevin Chan from HCI on a close 15-14 margin. The Men’s Épée event was no less of a tense fight, with RI’s fencers pitted against tough and experienced opponents. The Round of 16 saw Zhan Zhide (15S06B) and Kumar Baid Dhruv (15S06L) paired against each other, whilst Paul Rin (16S06K) faced off against senior and fellow teammate Loh Huai Kai (15S06I). Effectively, Raffles was guaranteed a place in the quarterfinals, but at the cost of two fencers being eliminated by their peers. Keeping in mind the spirit of friendly competition and mutual respect, Paul and Zhide progressed to the quarterfinals. Paul put up a valiant performance, rallying his momentum and pulling back from an initial 1-5 disadvantage to 9-11, before losing 11-15 to HCI’s Justin Lim, the eventual champion of this event. Despite Zhide’s best efforts, he lost 3-15 to Jean Hun of TPJC, and the RI épéeists were dropped from the Épée title’s running. RI’s top performing sabreur Isaiah Tan (15606G) performed commendably in his early rounds, attaining second overall position in the qualifiers after gruelling bouts against fierce competition. Although Isaiah sparred skillfully, Tan Yue Fang from IJC was the one to leave the quarterfinals victorious on a 15-2 scoreline. Raffles Institution’s Chloe Chu lunges forward to score. The Women foilists weren’t about to be outperformed either; Chloe Wong (15S06N) sprinted her way through after qualifying overall second in the preliminary bouts with a comfortable 25 points. But the finals was certainly no walkover. In an exhilarating confrontation against CJC and national team fencer Rachel Yu, the duo matched each other closely in points. Advantages were almost immediately lost as the other responded in turn, exploiting weaknesses and executing highly-precise but equally well-calculated attacks. The scoreline froze at a stalemate three times throughout the entire finals — Chloe lost her 5-1 lead to 5-5, then 9-9, and finally 11-11. The stakes surged incredibly as the timer hit zero: the next point would be the game-deciding tiebreaker. A decisive lunge by Chloe brought an end to the finals’ nail-biting suspense, with the champion’s title ceded to RI amid resounding applause. All of RI’s fencers in the Women’s Épée event made it past the preliminary stages with little difficulty. Fencers Chloe Chu (16S01E) (who also performed well in Women’s Sabre) and Grace Tern (15S03E) fought their way into the quarterfinals comfortably — until Chloe meets HCI’s Cher-Lyn Low in the quarterfinal match with great difficulty, ending the match with a close defeat of 15-12 despite her best efforts. Our first runner up Grace picked up an early lead, breezing through to the quarterfinals, then beating HCI’s Lim Jie Ying 15-4 to secure a spot in the finals. Facing off against national fencer Nicole Aw from NUSHS, Grace’s focus and agility was unwavering by neither her opponent’s threatening attacks nor the clock ticking down slowly. She fought for every point to the best of her abilities, but her friend and competitor was simply too high a hurdle — closing the match with a tight scoreline of 15-12. True to her name, Grace remained respectful and gracious in defeat, embracing her counterpart — an inspiring display of sportsmanship and sheer dedication to the sport they all loved. Our quarterfinalists of the Women’s Sabre event included Denise Tan, Cheng Wai Yee and Chloe Chu. Chloe’s match against eventual champion Lim Xin Yi was particularly stirring as she fought on despite the immense lead her opponent had over her. Every point by Chloe was received with cheers of encouragement by the Rafflesians — though it was a mere 3 point she had scored in the entire match, Chloe’s perseverance was admirable. Cheng Wai Yee’s flawless performance continued in the quarter finals as she and Denise Tan advanced to the semis with little difficulty. Wai Yee’s competes with Chloe’s previous opponent, Xin Yi, and puts up a good fight against the eventual champion. Despite her skilful sparring, Wai Yee lost 15-8 to Xin Yi, leaving Denise to face Xin Yi in the finals. 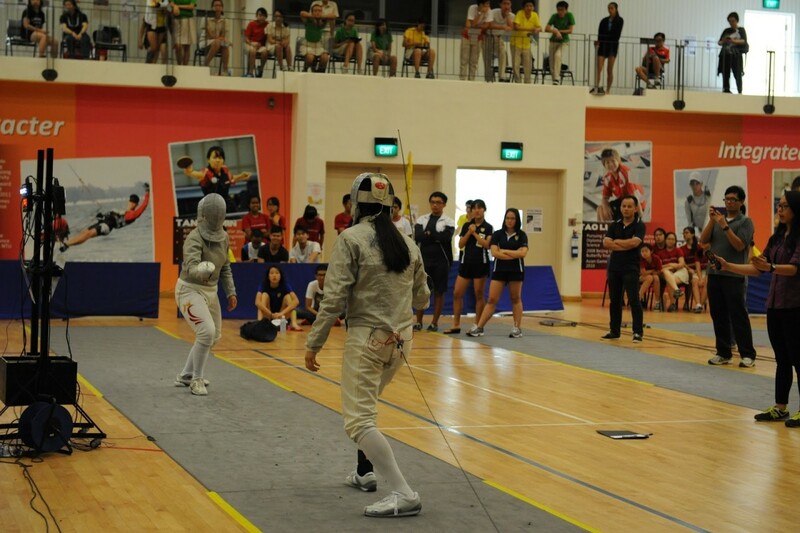 Denise Tan (15S06N) bested every one of her opponents in the preliminary bouts. Each hard-earned score was accompanied with her fearless cries of triumph, which soon gained the attention of many competitors. Her relentlessly aggressive style made her one to be wary of. Up against NYJC’s formidable fencer Lim Xin Yi in the finals, the pressure built as each fencer fought point for point on the strip — the scores on each side inching closer and closer to the coveted 15. The match peaked as the scoreboard flashed a worrying 14-12 to NYJC. Denise resiliently pushed on, closing the gap to 14-13 against the backdrop of roaring cheers of Rafflesians, but ultimately lost 15-13. Still, her remarkable fight was truly one for the books — her teammates gathered around to share reassuring embraces and kind words of encouragement. As the fencers celebrated their individual successes, they never once forgot their belonging to something greater than themselves: one team gunning for common goals. Captains Chloe Wong and Ian Chung (15S03I) were pleased to say that “words could not emphasise enough the appreciation and joy” they felt for their team’s effort and hard work. “They forged a team spirit that could last a lifetime, and made memories that they would cherish forever. They got up, and never gave up”, asserted the captains, who acknowledged that victory was pleasant, but only ever secondary to the shared experiences and closer relationships forged. “Winning was just a bonus,” Grace concurred, “It was heartening to see everyone giving their all and knowing they’ll leave without any regrets. It wasn’t just about the results. It was knowing I had given my all,”. Our fencers put in long hours and boundless effort to perfect their craft, never doubting the solidarity of their collective spirit. “One would think that fencing is a solely individual sport, but what we have experienced over the last 2 days has shattered that notion,” said the two Captains unanimously. Weapon Captain Ariel praised the team’s combined determination, “Everyone did much better as a team, and functioned really well together,”. 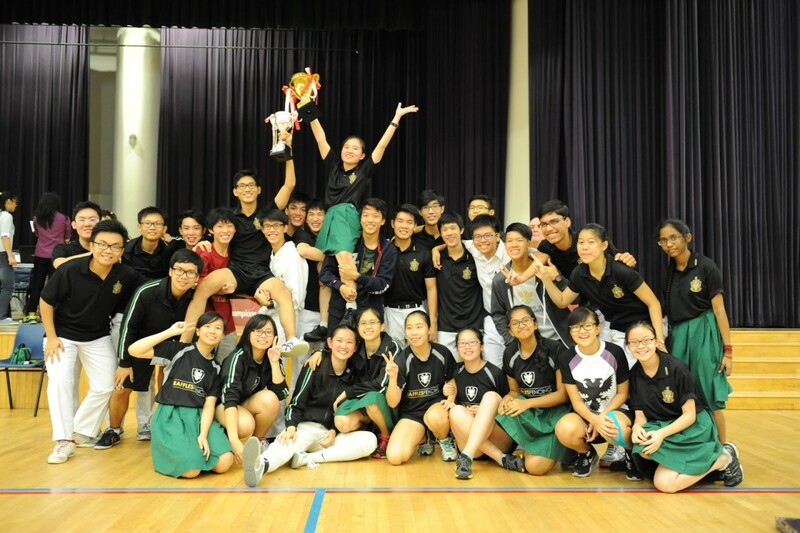 And if there’s one thing we learnt from this season, the Rafflesians certainly rose together — as a team. It was indeed inspirational to see each fencer never allow their individual aptitude get the better of team strength, or lose sight of their shared aspirations; it wasn’t just about themselves, but always being there to break each other’s falls and support them on their ascents.